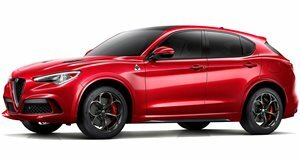 Having only been on sale since 2017, the Alfa Romeo Stelvio isn’t in dire need of a facelift, but the Italian automaker is already preparing a makeover for its first ever SUV. Our spy photographers have spotted some Stelvio and Stelvio Quadrifoglio prototypes undergoing testing, but there aren’t any visible visual changes. The Stelvio Quadrifoglio prototype is partially camouflaged at the front and rear, however, meaning the production model will likely have new front and rear bumpers and possibly revised headlights and taillights. More significant changes were found inside the facelifted Alfa Romeo Stelvio. Someone forgot to cover up the interior of some of the prototypes, revealing a redesigned lower center console. A closer look also reveals a new gear shifter and different-looking surrounding dials and buttons than the current model’s. The button for the electronic park brake is now located next to the gear shifter and the armrest between the seats has also been redesigned. Similar changes could also be applied to the Giulia, as prototypes of the sedan were also spotted with the fleet of Stelvios. Since this is still an early prototype, we’re expecting to see more styling changes as development evolves. Under the hood, we’re not expecting the Stelvio facelift to receive any powertrain changes. 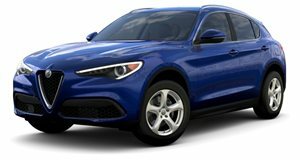 The current Stelvio is powered by a 2.0-liter turbocharged inline-four engine producing 280 horsepower and 306 lb-ft of torque, while the more powerful Quadrifoglio version features a 2.9-liter twin turbo V6 with 505 hp and 443 lb-ft of torque. Both powertrains are mated to an eight-speed automatic transmission. It’s difficult to predict when the updated Stelvio will be revealed, but Alfa Romeo’s product roadmap has already confirmed the Stelvio and Giulia facelifts will go on sale by 2022.